Sibelius Hall, an impressive wooden concert hall and congress centre, was built on the Vesijärvi waterfront in spring 2000. 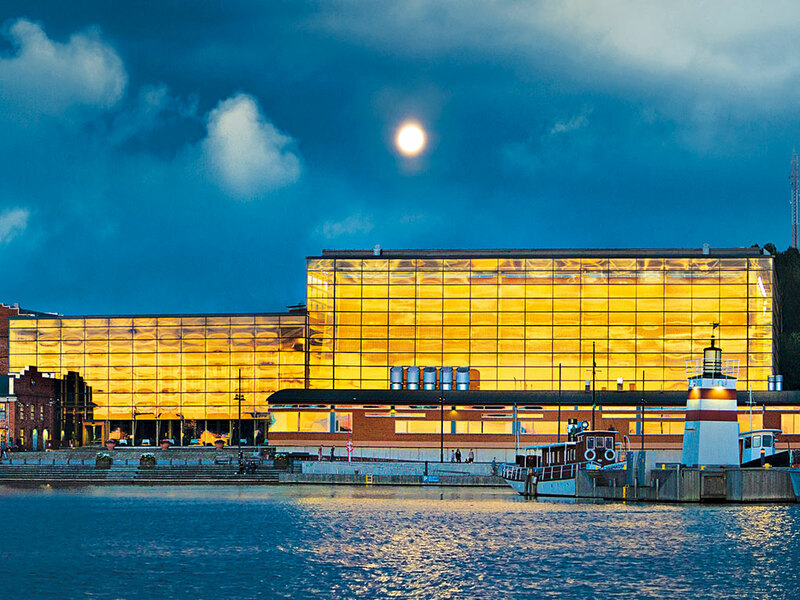 This unique meetings and events venue is one of the largest public wooden buildings ever constructed in Finland, and the industrial history of the structure is combined with modern, visually stunning architecture. The centre’s array of exceptional rooms and venues is home to many events all year round, from annual company celebrations, dinners and award galas to birthday parties and weddings. Even during its brief lifespan, Sibelius Hall has hosted hundreds of high-level meetings, festivals and events. On the high ceiling of Sibelius Hall’s Forest Hall, lying in the nook of large tree branches, there is a star chart that allows you to see where the stars were twinkling when Maestro Jean Sibelius was born more than 150 years ago. From there, guests can take a look through the hall’s grand glass wall at the sights of today: the sun shines and sets over Lake Vesijärvi; the wind blows across the waters; the rhythm of the harbour can be heard; and the night lights of the city can be seen dancing on the shores. This is why Forest Hall is often said to be the heart of Sibelius Hall, combining its various sections. The view over Lake Vesijärvi in particular makes Forest Hall a unique exhibition and trade fair facility throughout the year, with the capacity to host up to 1,500 people. Sibelius Hall’s beautiful Main Hall, meanwhile, is known internationally for its excellent acoustics. The Wall Street Journal placed Sibelius Hall on its list of five of Europe’s best concert halls in 2015, while according to The Guardian it is the one of the 10 best concert halls in the world. In addition to being a uniquely oval-shaped concert hall, the Main Hall serves as a meeting and conference facility, providing an atmospheric setting. The congress wing of Sibelius Hall has five versatile meeting facilities capable of hosting between 20 and 140 people, all with beautiful views over the lake. Located in the old part of the Sibelius Hall is the Carpenter’s Workshop, which acts as a multifunctional facility: on the street level it is an intimate yet effective facility that can be turned into anything between a lounge and an exhibition venue. It also has a fixed stage and a bar. This venue is not suitable only for conferences, lectures and exhibitions, but also private concerts and parties. As the sun sets over Lake Vesijärvi, the hall’s doors open for an evening of exhilarating live music performances. This old factory hall was refurbished into a music club and now has an ambience any music lover will approve of. High up in the old part of Sibelius Hall, an impressive window view opens from the centre’s VIP sauna into the Forest Hall. It provides additional capacity for events and meetings of up to 16 people. Located at street level, the Lastu Restaurant serves lunch and also provides a setting for events and intermission catering. The essence of the food is a combination of the best local ingredients merged with visually stunning finish. 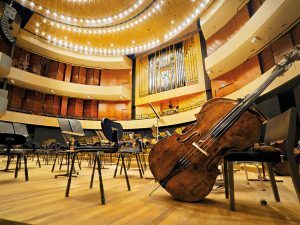 In each of these venues, Sibelius Hall’s highly professional staff ensures the requirements of your event are met in the finest detail.